Everyone always makes the old stand-by for Christmas: "Sugar Cookies", and I thought to myself, "I want to make Chocolate ones!" So, since we are chocoholics here at The Chocolate Muffin Tree, I searched for a recipe (there are not too may of them out there!!) and found a wonderful recipe at Myrecipes.com here for Chocolate Sugar Cookies! Yum! Here are some of our beautiful cookies. Here are some with just sprinkles. 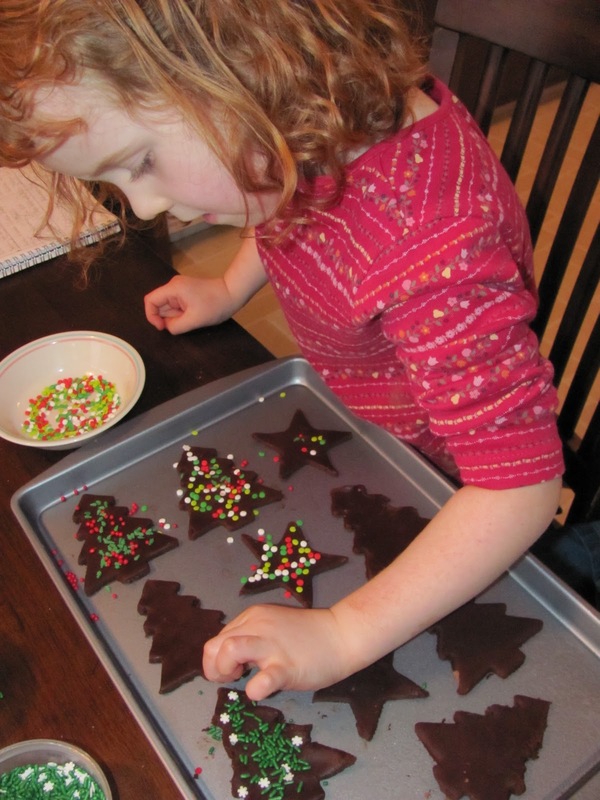 They are pictured with are So Easy Peppermint Bark that we made! The recipe makes a less sweet chocolate cookie, but with added sprinkles or frosting the taste is perfect! Beat with a hand mixer until smooth. Cassie had a lot FUN making them! Make sure to put the sprinkles on before baking. If you are making the frosting kind, frost after baked and then put on the sprinkles!!! More Chocolate recipes are on there way....stay tuned! 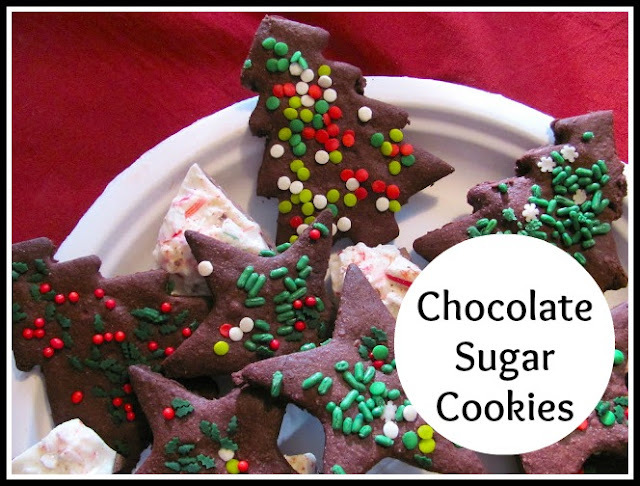 Have you ever made Chocolate Sugar Cookies? What kinds of Chocolate Cookies do you make? These look yummy. My favorite chocolate cookies are these - http://allrecipes.com/recipe/chocolate-chocolate-chip-cookies-i/detail.aspx. Daughter adores them! These do look so good! I made chocolate-gingerbread cookies one year at home when my son was little. They were very yummy as well. I'll look for the recipe (it came out of the newspaper - and they were cut in the shape of bears, with ribbons tied around the neck in a bow - quite cute) and if I find it, I will send it to you here, Melissa. Cassie has made several wonderful cookies and treats this year - you sure manage to have fun together!